NEW – Start Our 6 Week Beginner Tai Chi Course – Price: $80.00 Next Start Date: May 7, 2019 – Link to buy: 6 Week Beginner Tai Chi Course! Tai Chi is an ancient Chinese form of exercise that is still being practiced by millions of people all over the world. Anyone at any age can do Tai Chi. It’s never too late to learn. Unlike many other exercises and workout fads that come and go, Tai Chi actually works and has withstood the test of time. 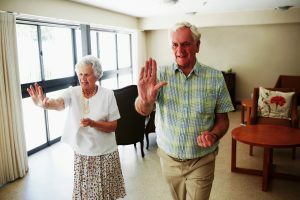 For health, Tai Chi has been tested and proven to help heal and rehabilitate many ailments such as: heart disease, balance issues, flexibility, arthritis, depression, anxiety, joint problems, and injuries just to name a few. These benefits have been studied and reported by the Harvard Medical School, the Mayo Clinic, and many other reputable international health organizations. Originating in China as a martial art in about the 12th century, Tai Chi is known as The Supreme Ultimate Fist. The founder of Yang Tai Chi, Yang Lu Chan, was called “Yang the Unbeatable” and was appointed to teach China’s Imperial Guard this martial art’s superior fighting techniques. Although Tai Chi wasn’t initially created for health purposes, ordinary villagers and town people in China began to witness that these groups of Tai Chi martial artists were all healthier and living longer than the average person. Today Tai Chi is revered around the world for both its health and martial achievements. How Tai Chi Works A person practicing Tai Chi moves their body with intention, using slow and relaxed movements. Scientific studies now reveal that the combination of form, breathing, and meditation techniques allows for many benefits including massaging the internal organs through a combination of breath and movement; allowing for the exchange of gases in the lungs through a relaxed body and breath work; and aiding the digestive system to work more efficiently through learning to sink and relax the pressure downward. Tai Chi can also increase grey matter in the brain, which boosts awareness and calmness. The ancient martial artists who lived well into their late 90s and 100s enjoyed all of these benefits. Because they actually looked and felt younger and more lucid as they aged, it wasn’t long before Tai Chi became the most sought after exercise to do in China. And yet, people also began to realize that the many health benefits could not be attained without the martial concepts. This is the essence and paradox of Tai Chi — that you cannot attain the health without also cultivating the martial art. Such is the balance and harmony of yin and yang. Easy to Learn, Tai Chi is very easy to learn and quickly becomes more than a workout. Because of the depth to this art, it becomes a way of life for many. You eventually realize that Tai Chi has permeated every area of your life. The way you stand and move, how you do ordinary chores, and even in the way you think, you become more aware and more relaxed in everything you do. Are you ready to try out a class? 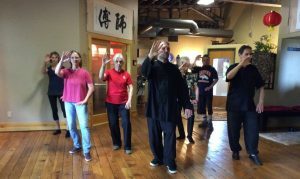 If you are a beginner to Tai Chi we highly recommend starting with our (Tai Chi 108 Form Beginner Class) see our Class Schedule for class days & times. In addition to daily Tai Chi classes at our Colorado Springs location The Tai Chi Association, we also offer a complete Online learning curriculum, allowing you to study with Sifu Michael Paler in the privacy of your own home and at your convenience. This online Curriculum is Not required, but highly recommended for new students. 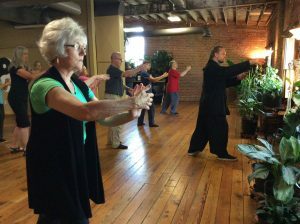 This optional Tai Chi Online curriculum is separate from the classes and packages held at our school the Tai Chi Association of Colorado Spring. Sifu Michael Paler created this online program especially for the Tai Chi beginner. 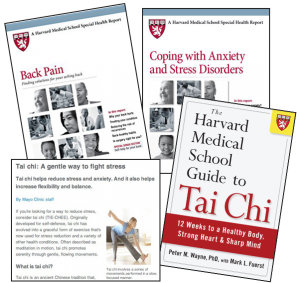 This curriculum takes you through each and every tai chi movement in order, eventually teaching you the entire Yang Style 108 Form, Warm Up exercise, Basic Skills including Stances and Weight Positions, as well as Optional 100 day exercises, Yang Cheng Fu’s 10 essential principles, Qigongs and 2-Person exercises. Our online learning curriculum is designed for all levels of learning, beginner through advanced. 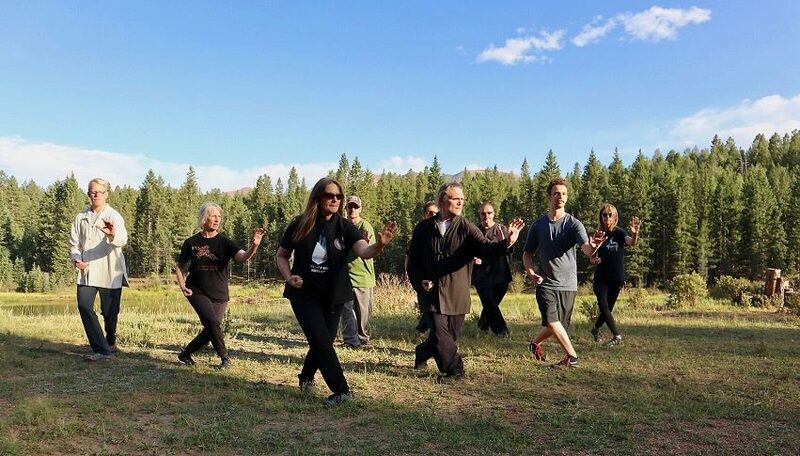 I will personally show you how to create a Tai Chi body by teaching you correct form and principles that will enhance your Tai Chi form, your health and change your life. When you sign up you will receive instant access to your first 9 instructional videos. including the Tai Chi Stretch and Warm-up Exercise. Then each month you will receive access to the next series of videos, that you can watch at your own pace. Plus, you will have personal access to Sifu Michael through our members only forum. This online learning course now has over 100 instructional videos ready to view. Now you can stream Tai Chi online from any of your favorite devices — your phone, Ipad, laptop or any monitor. The Tai Chi Association was voted in the local newspaper The Colorado Springs Independent #1 GOLD WINNER’S in the category of Martial Arts, in 2012, 2013, 2014, 2015, 2016 and NOW 2017, and The Gazettes Best of Colorado Springs winner in the category of Martial Arts in 2015 and 2016. Our teacher, Sifu Michael Paler, 7th Generation (Lineage Disciple of Wei Xilan Imperial Yang Family Tai Chi) has over 32 years experience in Chinese Martial Arts with a focus on Tai Chi and various Qigongs.